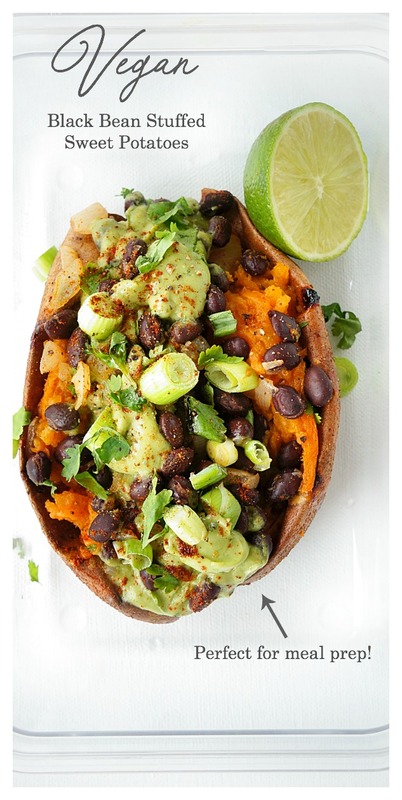 It turns out that there are so many flavour combos that taste even more amazing when stuffed into a sweet potato. 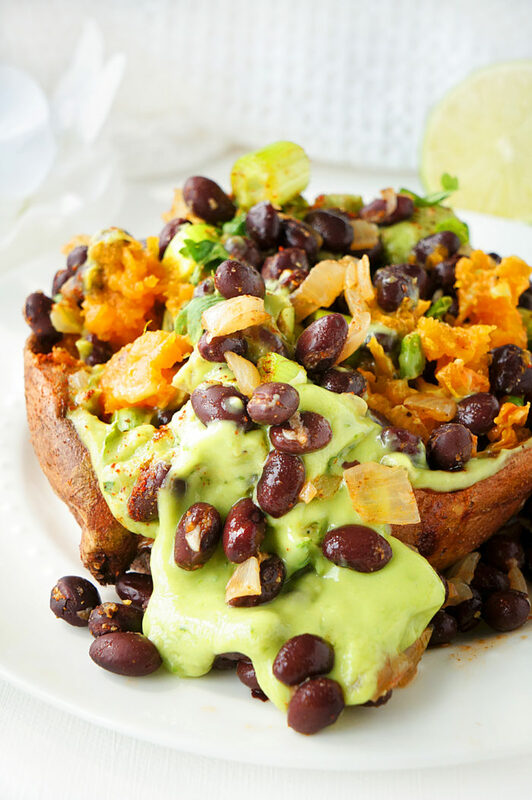 A few weeks ago I posted my recipe for Cashew Pesto Stuffed Sweet Potatoes and more recently I’ve been experimenting with vegan options like these Black Bean Stuffed Sweet Potatoes with an Avocado Creme. It looks fancy, sounds fancy, but the prep? In fact, it’s super simple. Open cans of beans. Drain and rinse. Throw into pan with onion, garlic and spices and cook for several minutes. Pile the roasted sweet potato high with ALL. THE. THINGS. Now you’ll notice that this recipe makes eight servings which makes it awesome for meal prep, but really, you have a few different options. 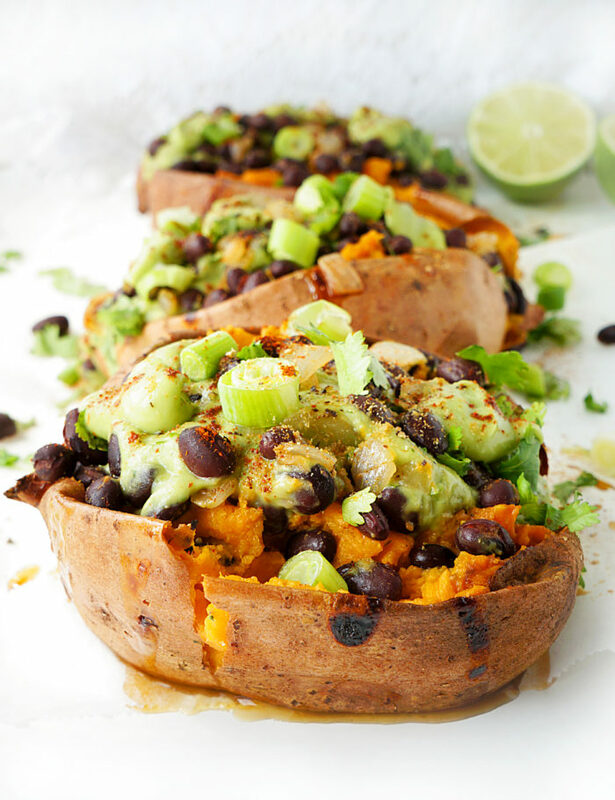 Option #1: Make all eight black bean stuffed sweet potatoes and eat them all week for lunch AND dinner. Which I would totally do. 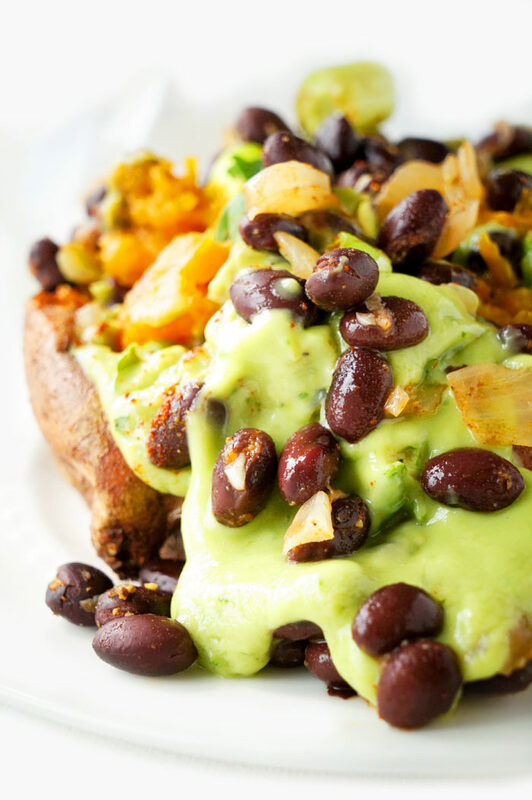 Option #2: Make the full bean and avocado creme mixture, but only load up four of the potatoes and save the rest of the bean and avocado mixture for Mexican black bean and rice bowls, which I’ll be posting in a couple of weeks. Neither option is better than the other. It just comes down to what you’re feeling that day. But at the end of the day, my point is, that you can get eight DELICIOUS and healthy meals out of this recipe. That’s what I call meal prepping like a pro. And can we talk about the fact that this dish is probably one of the most heart-healthy meals you’ll ever eat? 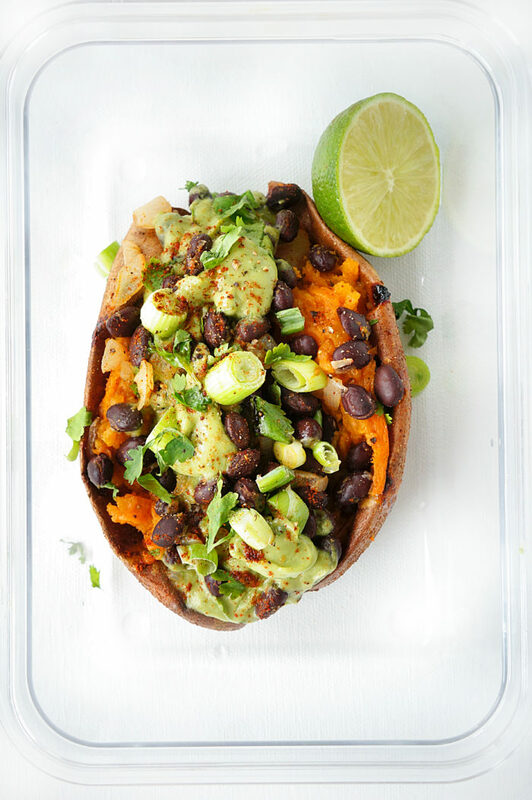 Sweet potatoes and avocado are loaded with potassium which can help manage blood pressure, not to mention the healthy fats and fibre found in the avocado, sweet potatoes and beans which can all help to lower cholesterol. That is one heck of a meatless meal, my friends! But there is so much flavour and texture in this meal, you won’t even miss the meat. 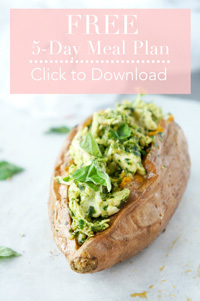 And if you do, try out my Pesto Chicken Stuffed Sweet Potatoes. 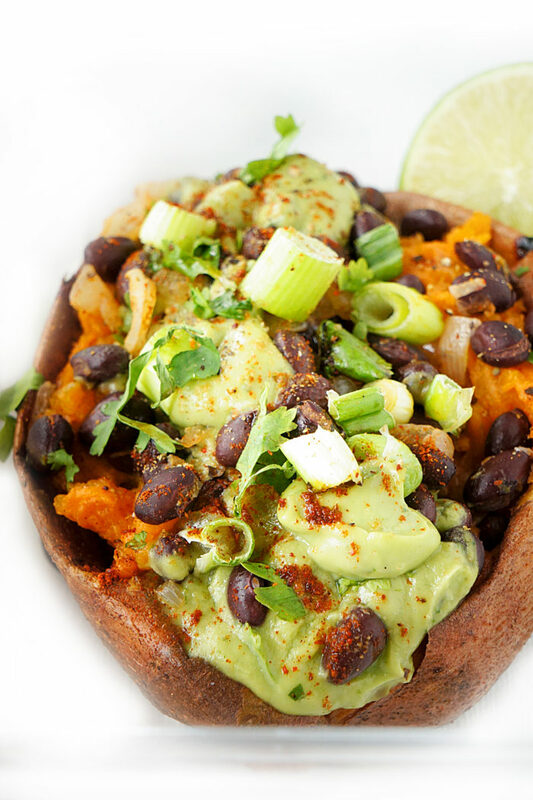 Everyone needs a stuffed sweet potato in their life. 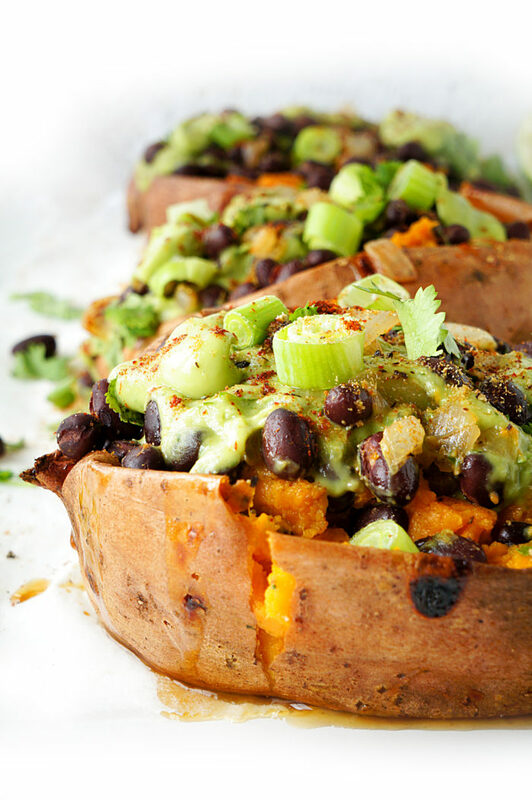 Preheat oven to 400 degrees F. Pierce each sweet potato all over with a fork. Spray baking sheet with cooking spray or line with parchment paper and place sweet potatoes on sheet. Bake for 45-60min until flesh is tender. Meanwhile, in a medium-sized skillet heat oil over medium heat. Cook the onions and garlic until softened and fragrant (approximately 3-5 minutes). Add the chili powder, cumin and beans and cook for another 1-2 minutes. Add the lime juice, salt and pepper and stir until combined. Next, to make the avocado creme, place avocado, coconut milk, lime juice, cilantro. garlic and salt in a food processor or magic bullet and blend until smooth. Once the sweet potatoes are cooked, cut in half lengthwise and use a fork to slightly mash the inside of the potato, leaving the skin intact. Sprinkle with a dash of salt and pepper, if desired. 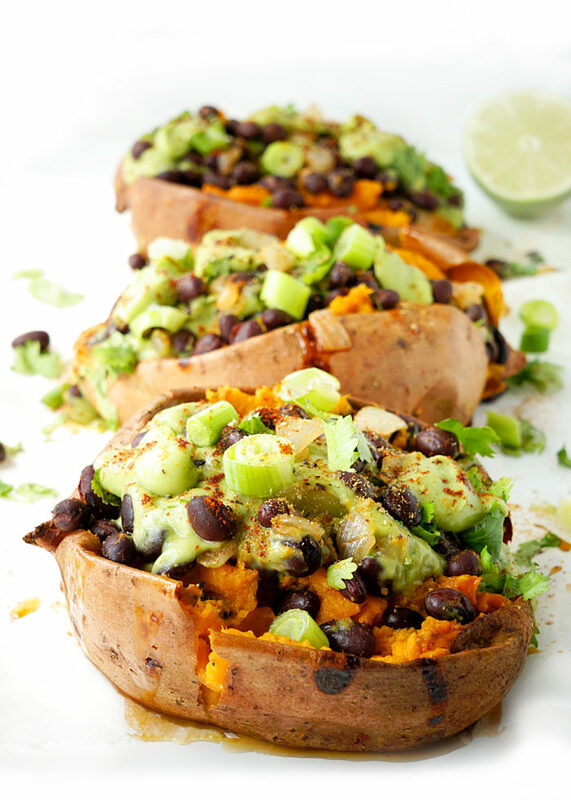 Top each potato half with black bean mixture and avocado creme. Garnish with additional chili powder, cumin, chopped cilantro, and green onions, if desired. Serve immediately.